Brilliant crimson colour.Very fresh fruit aromas with a hint of floral notes. A touch of liquorice and spices on the palate. 16° with roast pigeonor "grattin of red berries. At the foot of the dentelles de Montmirail, with a very sunny climate. Quaternary terrace with clay and silt pebbles. Hand-harvesting. Traditional 3-week vatting. The free-run juice is blended. Matured in "foudres" for 12 to18 months. Vintage 2015: The nose is aromatic and relatively elegant. It reveals notes of cassis, boysenberry and slight hints of crushed black cherry associated with a discreet hint of zan, gar¬rigue, caramelization as well as an imperceptible hint of white pepper (in the background). The palate is fruity, fine, sleek, nicely juicy, racy and offers a slight mineral frame, a small suavity as well as a slight gour¬mandize. In the mouth this wine expresses notes of juicy blueberry, black cherry and slight hints of ripe red fruits associated with woody hints, discreet hints of thyme, spices as well as an imperceptible hint of gray pepper (in the background). Tannins are well-built. Good length and persistence on notes of (very) ripe black fruits and liquorices. 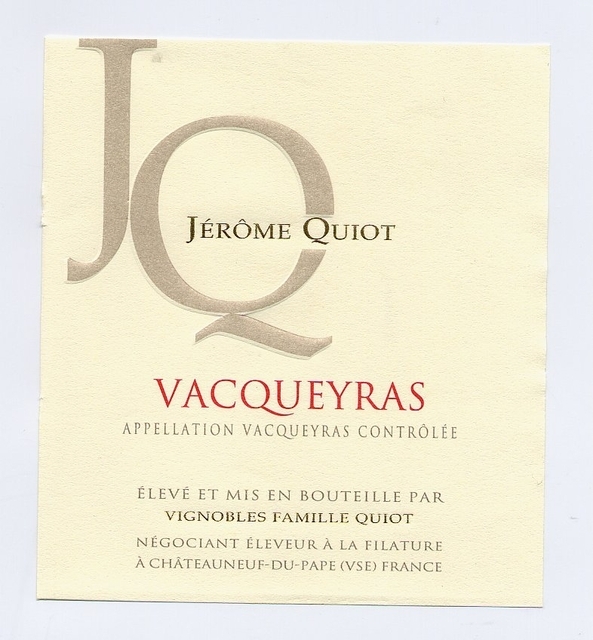 vintage 2010 A blend of Grenache, Syrah, and Mourvedre that is aged 90% in foudre and 10% in smaller barrels, the 2010 Jerome Quiot is elegant, finesse-driven 2010 that has a sweet perfume of spice, spring flowers, and assorted berry-like fruit. Medium-bodied, lightly textured, and with a good acidity and a supple, very drinkable profile, this delicious Vacqueyras will continue to shine for 5-7 years.